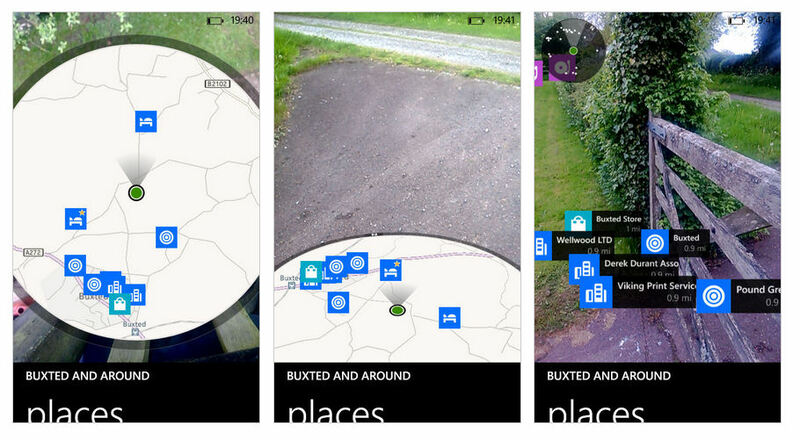 Nokia's HERE Maps app for Windows Phone 8 has been updated to version 3.3.354, adding integration with Nokia's LiveSight technology. In action, HERE Maps new LiveSight mode shows a gradual transition from a digital map view to an augmented reality view as you hold the device up to "look through the screen" at the world around you, making it easier to identify places around you. The update also adds an integrated compass mode to the main map view, enabling auto-rotation of maps and making it easier to orientate yourself when you first start the app. Both the new features in HERE Maps 3.3 are best described as ways of making a better connection between the screen based digital map and the surrounding real world. Nokia describes this "bridging of the virtual and real worlds" as a core part of its location strategy. Nokia's LiveSight technology was first seen in the HERE City Lens product. It shows a live view from the camera (reality) overlaid with icons (augmented) representing specific places. 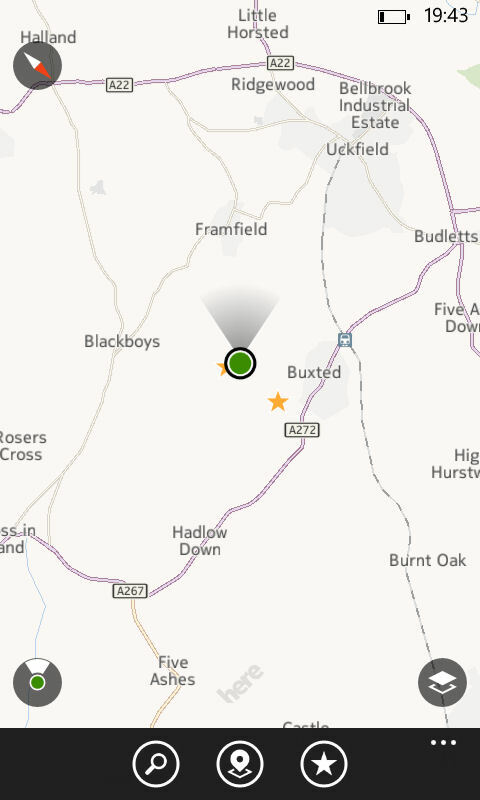 Previous updates to HERE Maps have seen summary information from, and links to, HERE Transport and HERE Drive integrated into HERE Maps. The latest update does the same for HERE City Lens, but rather than just linking to HERE City Lens, the LiveSight experience is bought inside HERE Maps, marking this out as the most significant upgrade to HERE Maps in the last twelve months. LiveSight mode can be seen as a solution to the last 100 metres of navigation. Conventional directions will usually lead you to roughly the right area (e.g. post code area or street name), but it can be tricky to find the exact place. LiveSight mode can potentially solve this problem by providing identification for a specific building, essentially allowing you to "see" your destination through your phone's display. However, just as importantly, LiveSight mode also provides a superior local discovery mode compared to conventional map views. Rather than simply identifying potential places of interest on a digital map, it is able to identify places of interest that are right in front of you. While it is possible to overplay this aspect of augmented reality, it's not hard to see how this connection to reality can increase the likelihood of discovering serendipitous opportunities. In HERE Maps, the LiveSight view can be activated directly from the main map view by tapping on the LiveSight eye icon. Alternatively, you can activate LiveSight mode from the map options/layers menu. In either case, HERE Maps will search for nearby places (i.e. 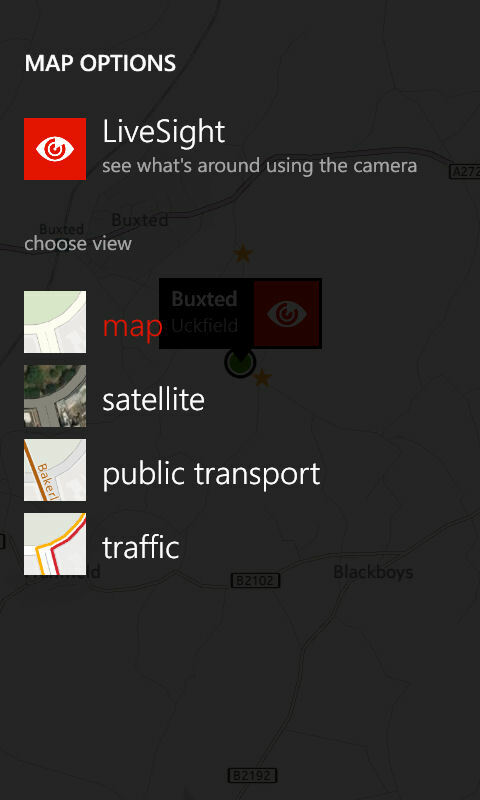 the HERE Maps place mode) before loading them into the LiveSight view. When you switch to LiveSight mode, the view combines a traditional digital map with a live view from the camera shown underneath. As you move the phone up from the horizontal plane (i.e. as you look down at the phone in your hand) to the vertical plane (i.e. as if you are looking through the screen) these two elements change, with the augmented camera view eventually completely taking over the screen. The exact way places are displayed in LiveSight view will depend on your location. In an urban situation, you will typically see places (businesses) located on the same street as your current location. Indeed the icons and associated names will appear to hover over their real world equivalents, staying "fixed" in real-space as you pan around with your device. 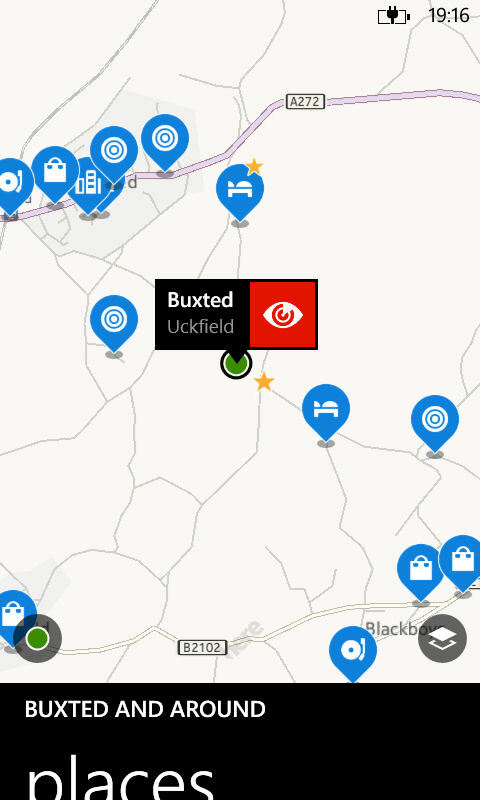 In more rural areas, the places shown by LiveSight may be further away, so this vrtual labelling efffect is lessened, but it's still a useful way to explore nearby. In both cases, the nearest places are shown with both an icon and associated name, while more distant places are represented solely by an icon. However, these more distant places can be bought into full view by sliding a finger down the screen, or tapping on the icon. Tapping on a place name opens up the standard HERE Maps place page for that business or location, with the associated information (photos, reviews, phone numbers, and so on). Although not immediately obvious, it is possible to limit the type of places shown in LiveSight mode, either by performing a search and then switching to LiveSight mode, or by selecting a specific category in (nearby) places mode. This can be helpful when you're looking for something specific or don't want to be overwhelmed by information. HERE Maps' new integrated compass functionality arrives in the form of an optional compass mode in the main map view, which is activated by tapping on the 'my location' symbol in the bottom left hand corner of the screen. Turning on compass mode does two things: firstly, it adds a field of view indication to the location indicator, and, secondly, it rotates the map so that the direction that the phone is facing is at the top of the screen (i.e. automatically rotating map). Compass mode is useful for orientating yourself on a map and is particularly useful when you arrive at a new place without any directional compass cues (e.g. when exiting from the underground). Other minor updates in this release include a number of bug fixes and stability improvements. HERE Maps now features LiveSight, which brings the power of sight to your map. Tap the “LiveSight” icon and HERE Maps reveals virtual signs for restaurants, galleries, shops, and sights attached to the buildings in your camera display so you can pinpoint exactly where you’re going just by looking. And true offline maps let you navigate in 94 countries in full offline mode. 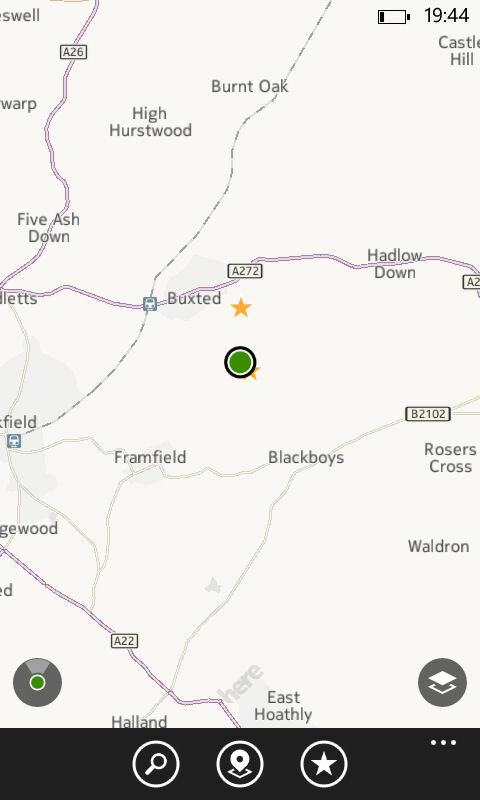 HERE Maps is a free download from the Windows Phone Store. HERE Maps is also available for non-Nokia Windows Phone devices, but only in select markets (US, Canada, Mexico, UK, France, Germany, Italy and Spain).